The Lodge at Hideaway Hollow is convenient to both Blue Ridge GA and the Ocoee River (east end). It is very close to the GA/TN state line. This cabin is a very unique property, abundant with character and a western theme. This large mountain lodge is overflowing with amenities and space. It has two living rooms with flat screen tv's), 4 bedrooms and 2 1/2 baths in the main lodge. There is a separate recreation house referred to as Ally Gator's Saloon (the game room is included in the rental). The saloon comes complete with 5th bunkhouse style bedroom (upstairs), pool table, dart board, tv, fridge, microwave, and boom box. 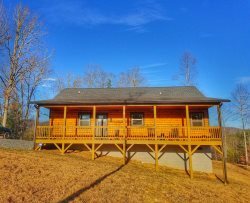 The Lodge at Hideaway Hollow is secluded yet convenient to Blanche Manor Trail rides, Ocoee Whitewater rafting, Toccoa River tubing, and shopping and dining in Copperhill or Blue Ridge. You will be sure to come back and vacation at this cabin every year! *This cabin has an outdoor fire pit, however firewood is not included in the nightly rate. You can bring your own or we can deliver an ample supply for a weekend stay for $35. You will need to provide your own starter log or kindling. We need at least 48 hrs notice for delivery. Beautiful and Secluded Conveniently located, housed all of our crew nicely. Internet and Wi-Fi had slow reception. (AT&T) Property mgmt. was there soon after any call. We had a wonderful stay! Mountain Woodland Retreat ★ ★ ★ ★ ★ This property is for sale at a listing of about $380,000...which for either an investor or someone who might truly love living in a mountain woodland getaway-from-it-all hideaway might be a perfect purchase. With 4 bedrooms it would be great for 8 to 10 (using the couches for the extra 2). Well maintained with several outlying buildings and a game room which currently has a pool table in it. Property is surrounded by trees, and entrance road to the home could be broadened and trees cut back a bit. We rented in September to run away from Hurricane Irma and the place was perfect for us...as its location is only an hour from Chattanooga...and rent averaged out to about $300 a night with added taxes, etc. Bryan, The cabin was beautiful. We had a great time and felt very welcomed. Thank you. T.H. Debbie Ketter 5 star- Great place lots of space and nice and clean. The deck with hot tub was very spacious and we had a nice family get together with family from Ducktown, Cleveland , Chattanooga Atlanta Georgia, Melbourne Florida, Harrisonville Missouri and Nevada, Missouri . I would not hesitate to book again !! !